Using DAV Explorer, you can lock a resource, preventing anyone else from modifying it while it is locked. The lock stays active until it is unlocked, or it times out. DAV Explorer supports shared and exclusive locks through the File menu. 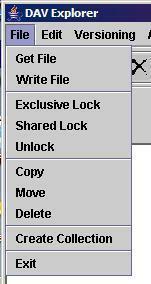 The lock icon on the toolbar always creates an exclusive lock. If the resource is successfully locked, a lock icon will appear to the left of the name of the locked resource. The screen below shows the resource "Readme.txt" after it has been locked. DAV Explorer requests a lock duration of 86,400 seconds, or 1 day, after which the lock times out, and is automatically removed from the resource. However, it is possible for a WebDAV server to have a different lock duration policy, ignoring the client request and assigning a different lock timeout. It is possible to submit a URL providing some contact information for the person taking out the lock. If another person desires write access to a locked resource, they can use this lock owner information to contact the owner of the lock, and discuss when they can get access. The lock owner field is usually either an "http" URL for a Web page, such as a home page with contact information, or a "mailto" URL, which has the email address of the lock owner. Enter the lock owner URL in the window that appears, then select "OK". 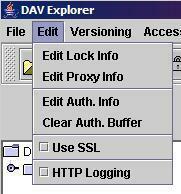 The lock owner information is saved when you exit DAV Explorer, and will persist across DAV Explorer sessions. Lock owner information is saved in the file "lockinfo.dat", which is stored in your home directory on Windows (NT and up) and Unix, or in "\" on Windows 95/98. The storage directory location comes from the Java "user.home" system property. This example shows an exclusive write lock, of depth 0, meaning the lock only applies to the current resource. A depth value of infinity indicates a lock was made on a collection, and recursively on all its sub-collections. The lock owner contains a "mailto" URL, giving the email address of the owner of the lock. The lock token is an identifier for the lock. The lock token is unique across space and time, and is often called a globally unique identifier, or GUID. The timeout field gives the number of seconds until the lock expires, starting from when the lock was generated.